Hello Readers! It's been a while since I've posted anything new here, but I've been busy working on lots of little projects and one big project in the Otherworld series. 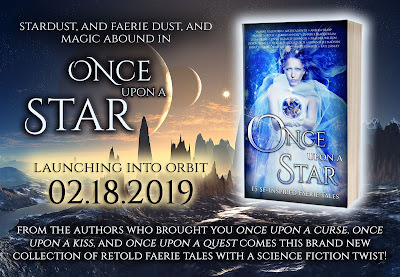 Although some of these books in progress won't be ready in the near future, I can announce the arrival of ONCE UPON A STAR, the latest installment of the Once Upon Anthology series. 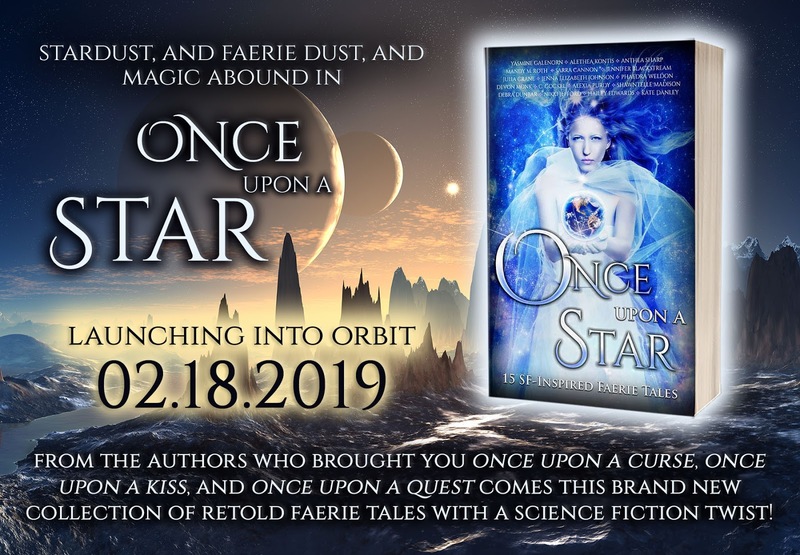 ONCE UPON A STAR will launch on Monday, February 18th, and will feature fourteen all new faerie tale retellings with a science fiction twist! My contribution is titled BY THE LIGHT OF A DISTANT STAR and is a retelling of The Goose Girl. I had so much fun writing in this genre, one I've never attempted before, and I hope you enjoy the story as much as I enjoyed writing it. Happy reading! Princess Estrelle’s marriage to Prince Damryn of Kaul is not just a means to establish a lucrative trade agreement between two galaxies, but a chance for her to begin a new life. But Estrelle’s fairytale future is put on hold when the woman transporting her to her new home steals her identity and leaves her for dead. With the help of her newfound friends, Estrelle discovers the courage to face her enemy and to fight for the one she has grown to love. AND NOW FOR A SNEAK PEEK OF BY THE LIGHT OF A DISTANT STAR! Estrelle swiped her fingers across the screen of her Glasslight, then tapped the symbol for her inbox. A list of messages scrolled by, her eyes flicking through them as she hunted for one in particular. When the familiar subject header caught her eye, she stopped it with a finger, the letter unfurling to fill the screen. Estrelle grinned and rose from the couch in her private quarters. With digital tablet in hand, she stepped through the gauzy curtains onto the shaded terrace just outside her room. The stones beneath her bare feet were rough and warm, their rusty color matching the barren landscape surrounding her family’s estate. Above, the broad leaves of the rossu vines climbing the wall and spreading across the pergola provided ample shade beneath Staerra, Parsa’s unforgiving sun. A wall fountain tucked away in the shadiest corner of her personal oasis offered some comfort, and once Estrelle was seated upon the edge of the shallow pool, she read her message for what must have been the hundredth time. In your last correspondence, you inquired after my favorite color. A simple question, but one I delight in answering. Blue, white, gray, and black dominate the planet of Kaul, and only in the spring and summer months, a mere third of the year, are we given the chance to admire a more varied color scheme in the birds and blossoms that burst forth with life then. Beauty abounds during that time, and all the people of the capital city pour onto the shores of the lake as it begins to thaw. I cannot describe how much I enjoy seeing the variety of hues during the warming season, but you were curious about a single color: My favorite. Despite all the lovely ones I have to choose from, I must admit red is my preferred pigment, only because it happens to be the color of the brightest star in our night sky. Not the brilliant red of furzel bird feathers, or the deep scarlet of the wild poppies in bloom during the mild season, but the warm crimson tone shining from a certain star that keeps me company during my evening walks. We call the star Hettar, the harbinger of summer, since it hovers on the horizon for most of the year only to climb higher when the thaw begins. It also happens to be the star your home planet orbits. I smile as I write this, wondering if the cosmic fates had some part in our arrangement. For who else would know to bring me a companion from the source of my hope and inspiration? Estrelle smiled and hugged the thin plane of glass to her chest. She couldn’t say why she kept coming back to this particular correspondence, but it always made her heart light when she read it. Received only a few weeks ago, it had been the first time the prince of Kaul had used a more intimate term of endearment to close his letter. And the first time he had signed off with only his name, no titles attached. Estrelle initially had no interest in courting Prince Damryn, but as the days wore on, he proved to be everything she could have hoped for in a mate: Charming, kind, and possessing a warm sense of humor that shone light into her soul. Through their correspondence, Estrelle learned they had much in common, despite being from two different worlds. Damryn had described the natural wonder of his planet, Kaul, the largest body circling his star, and one that spent the majority of its year wrapped in crystalline ice and snow. She, in turn, had described Parsa to him, in all its arid, crimson glory. They had bonded over their love of the natural worlds around them, seasoned with honesty and encouraged by the easy, patient nature they both possessed. Who would have ever guessed something which had begun with resistance and trepidation would blossom into eagerness and joy? Estrelle now reflected on that fact, smirking at the memory of the hour she’d learned her destiny would be so depressingly typical of a woman of her status. A little over a year ago, her great uncle and her mother had come to her with a proposal: Their solar system and the one on the other side of the recently discovered wormhole cluster wished to make a treaty. Both planets sat on the edges of their perspective galaxies, and both their rulers were interested in opening a trade agreement between their solar systems – an opportunity for both planets to act as the crossroads of an intergalactic port of commerce. The discovery of the wormhole cluster a decade before had made travel between the two edges of the galaxies much swifter than the usual mode of transportation. Instead of spending a month cramped on a cargo ship with advanced hyper speed capabilities, the wormholes allowed even the most basic starship to leap from the edge of Parsa’s solar system to Kaul’s in less than a week. Estrelle’s great uncle and Prince Damryn’s father, both emperors in their own right, jumped at the opportunity to strike a treaty between their two kingdoms. And an arranged marriage was the easiest, and most secure way, to ensure a successful contract. Since the Kaulian race produced multiple offspring at one time, the current emperor had plenty of sons and daughters to choose from, and Damryn was his youngest. Estrelle was the fourth daughter of the Parsan emperor’s sixth sister, also the youngest. Technically a princess, Estrelle was so far from the throne, she might as well have been a commoner. And since she had three older sisters who outranked her, she was chosen for the role of bride. Estrelle rejected the idea at first. Arranged marriage was something her distant ancestors, human beings, had practiced on the now dead planet Earth. Eventually, her mother and great uncle persuaded her to start a long-range correspondence with the prince, though she hadn’t placed much faith in the success of that venture. Oh, how wrong she’d been. With a wistful sigh, Estrelle closed the message she had practically memorized and leaned against the cool wall of her patio garden. She gazed out over the edge of the veranda and off into the far eastern hills. Staerra had slipped below the horizon, leaving the world hanging in a crimson twilight. Estrelle tilted her head back even farther, seeking out Yssa, the star that lit Damryn’s planet and the one closest to her own. There, in a gap between the rossu leaves, a window of darkening sky framed a burst of brilliant, pale blue fire. It would shine brightly over her world tonight, casting its cool light across the desert. And beneath its unyielding watch, she would dream of her new life and a future full of hope and opportunity. And gods willing, love. Continue reading Estrelle and Damryn's story on 02.18.2019!